Black Magic is not an album for lovers of technical metal or radical song variation. The first few listens of this album were relatively boring, but there were minor elements that kept luring me back. The more I listened, the more enamored I became with the guitar solos and vocal melodies. I love the unfalteringly massive guitar tone this album possesses and the way the band uses it. The guitar tone is rich and fuzzy in a very organic way, not a ‘gain knob cranked to 11’ way. The bass and guitar combine harmoniously as each plays off the power of the other. When played in unison, the guitar and bass move like a pyroclastic flow– fiery, powerful and destructive. When the guitar solos open up, the tone softens to a smooth yet heavy sound while the bass maintains the immense, punchy rhythm. The instances in which the bass deviates from the guitar to wander up and down the neck are always well executed and well placed. Andrew D’Cagna is a great bassist and it is evident he and guitarist Corey Roth write very well together. The guitar riffs are incredibly simple. They follow a very similar pattern throughout the album and there isn’t much melodic variation. The also fall into a habit of repeating a single riff too many times. But once you listen to the album a few times and become familiar with each track, the slight hints of flair begin to stand out more. Roth’s usage of dynamics is crucial to the flow of each song. He varies the strength with which he picks each note to match the mood of the song and to parallel the soft delivery of the vocals. Roth is the only guitarist but he does an incredible job filling out the solos with tasteful harmonies and layering the riffs. The solos are really refreshing­– much like a Gin and Tonic on a hot summer day. They are unique and are a major distinguishing factor between each song. 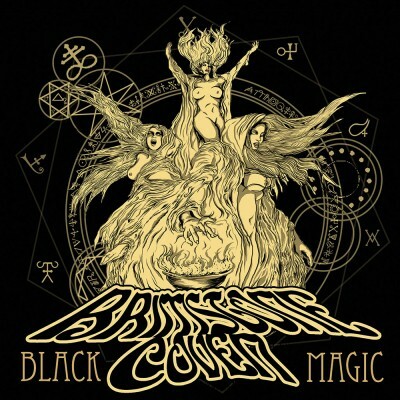 There is an endearing old-timey feel on this album reminiscent of Black Sabbath’s Master of Reality, especially in the verse riff on “Beyond the Astral.” Black Magic’s production definitely contributes to the throwback sound. There is little compression on the guitars so when they ring through good speakers, they can swallow the listener whole. The bass guitar has its own cozy place in the mix and never loses its distinctness. The drums are organic and the cymbals are tastefully splashed throughout. The sound of the snare and kick drum is subtle enough to not overpower with the guitars, yet impactful enough to punch its way through the wall of notes when necessary. “Big John” Williams’ vocals suit each song. His simple melodies seldom overstay their welcome and never attempt to suppress the guitar. The band made an excellent decision in production to mix the vocals slightly lower than the guitar, especially with how dominant the guitar tone is. The two sounds compliment each other instead of competing for the limelight. Each detail on this album ties together seamlessly so despite its simplicity, this album is still deep and enjoyable. Brimstone Coven did a great job on writing cohesive songs and the album progresses very naturally. Black Magic stays true to its sound throughout and I look forward to what the band will accomplish on their upcoming albums.